No complaining since it is what we’ve all been waiting for, right? Plus, garden fresh tomatoes taste so much better than grocery store tomatoes that it’s hard to let them go to waste. Any of them. And savor every single one! Soup truly is my number one way to use up extra tomatoes (or really almost any veggie). Here are a few of our favorites for tomatoes! I've been making this soup every couple days in the past couple weeks. It is soooo good and simple to make ahead! Roast the tomatoes on a baking sheet at 375 until softened and you can slip off the skins easily. Remove and discard the skins and keep all the juices and pulp in a bowl. Heat a pot with oil or butter. Saute onion until translucent, about 5-10 min. Add garlic and saute 1 more min. Add roasted tomatoes and broth. Simmer until onions are soft, about 10 more min. Puree. Add salt, pepper, balsamic vinegar, pesto, and cream to taste. Serve warm. 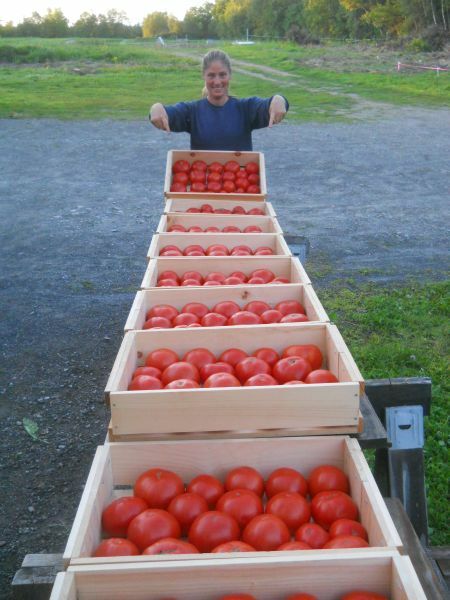 Assistant Farm Manager Robert recently made a batch of Gazpacho for a farm potluck and it was amazing! I forgot about how FRESH tasting it is! 1 TBLS fresh herb chopped like basil, cilantro, parsley etc. Combine all ingredients except sour cream. Blend it if you like the consistency more smooth. I personally like mine chunky so I don't. But Robert blended his! Top with a dollop of sour cream in each bowl. Serve cold. When I’ve got a fridge full of garden harvest with more on the way, I make an amazing vegetable soup with whatever I have that’s in season. It is different every time, but it always includes tomatoes and onions (or scallions or leeks or shallots, etc.) plus any combination of summer squash, zucchini, peppers, green beans, potatoes, carrots, greens, garlic, etc I've got on hand. Saute onions (and carrots if using) in oil until translucent. Add the rest of your veggies, chicken broth to cover, and tomatoes. Bring to a boil. Simmer until veggies are tender. Salt and pepper to taste. Mix all ingredients in a bowl and chill in the fridge for several hours or overnight before serving. This salsa is great with tortilla chips, with Mexican food, as a relish for fish, or on burgers in place of catsup. I love doing this! It's a great way to use up all kinds of extra veggies and you can even freeze it for later. Mmmmm! Heat the butter or olive oil in a pot over medium heat. Sauté onion until just soft, about 3-5 minutes. Add zucchini, bell pepper and garlic and sauté for another 3 minutes until zucchini is softening. Stir in tomatoes and basil and cook, stirring occasionally until sauce is slightly thickened, about 20 minutes. Season with salt and pepper. This sauce goes excellently over pasta, baked or grilled fish, or meatballs. If putting it over meatballs you can add ¼ cup beef stock to the sauce when you add the tomatoes, and cook it down slightly longer to evaporate some of the extra liquid. This deepens the flavor wonderfully. This recipe is a delicious one skillet meal for a lazy morning. It is really, really good. We top ours with a dollop of sour cream and have it with tortillas. Try it! In large skillet dry-roast cumin over high heat for 30 seconds. Add oil & onions and turn heat down to medium-high. Sauté 5 min. Add peppers, honey, bay, thyme & ½ of cilantro. Sauté 5-10 min. Add tomatoes & seasonings. Cook 10-15 min, stirring. Remove bay leaf. Make gaps in veggies. Crack eggs into gaps. Sprinkle salt on eggs, cover, & cook on medium-low heat about 10 min until eggs are set. Garnish with cilantro. Probably one of my very favorite summer recipes! I can't encourage you enough to try it! Plus it uses up tomatoes! How do you like to use up your garden's abundance of tomatoes? Please reply and let me know! I want to hear your favorites!